Day 28 of of The 30 Days of Yoga journey! Playful Yoga practice. Find Freedom Within the Form! Find a sense playfulness and a sense of freedom and wonder! Day 28 invites you to work out the kinks mindfully. This sequence is a great for those seeking to improve posture and connect to your core. This is excellent training for those seeking to create a regular and well rounded home practice. Build strength and flexibility and continue to integrate the breath. Enjoy the practice and whatever it serves up today. Open your heart! Be playful! Open yourself up to a new experience today! Become empowered as you continue each day to – make it your own. It was a fun time, even doing new and hard postions have their joyful side. Day 29 I am ready. – grateful that I was finally able to re-engage my yoga practice after dealing with some serious health issues. – grateful for 30-Days of YWA as practicing daily has allowed me to re-gain my core strength and flexibility. – grateful that I was able to twist into the reverse downward dog and shift from left to right with ease. – grateful that I was able to have fun playing in each pose on Day 28. – grateful to be part of a great community of kulas and this especially goes out to Adriene & Chris! I’ve always wondered what the purpose behind the halfway lift from forward fold is. P.S. thanks for the pushups…. I can’t really do them but I think I’m getting stronger. oh Adriene, I’ve been with you through these 20 something days of yoga… But uh, “I’m just going to flip my dog…” Say what!? Like its no big thang, just flip this dog right over…. Crash. Lol. Every time we go from forward fold to flat back, I wonder the same thing. What is this doing for us? I’d rather hang out in forward fold a little longer…. Loved today’s practice! It’s so great that we can have so much fun doing it! Thank you for teaching us that. I have too many favourite practices from this 30 day challenge. Just two days left for me! Wonderful practice, thank you again! you haved mentioned shoulder stands a couple of times during 30 days . i could not find it in the foundations , have you done one ?? I have so enjoyed this 30 day practice. I have never “flipped my dog” before so that was something new and interesting I enjoyed in practice today. Thank you for these videos. Thank you for being you. My goal was to practice a little each day and this challenge has helped me with that. I’m a practicing yogi – not an expert only what I call an intermediate novice and only due to some permanent physical constraints due to my spine. On that note, earlier last year while searching for some at home yoga videos I stumbled across Adriene Misler’s “Yoga With Adriene” (YWA) and her Reboot. Unfortunately, my health had deteriorated so much that I wasn’t able to get through even one session. However, after getting my health back under control thanks to my wonderful doctor’s I signed up for the 30-Day Challenge back in December 2014 and began on day one Jan 02, 2015. I found that with each session my body, and not only my physical body, was getting stronger and leaner. My family and friends said that I had that beaming glow again and I said that I am contributing it to not only eating healthier but also yoga and more specifically “Yoga With Adriene”. And the day that we had to flip the Dog I was amazed that I was able to do it – wasn’t graceful back then but now after doing a second round of YWA 30-Day Challenge, a 14-Day challenge and now I’m doing Reboot flipping my dog is a breeze. 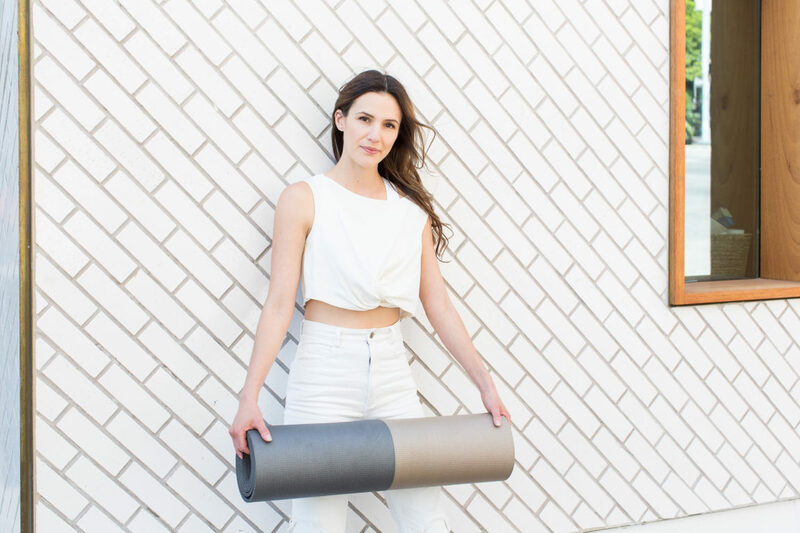 And when I find myself struggling during a pose Adriene’s soft voice comes into my head and says “Find What Feels Good” for you… This saying has now become my second mantra – my first is “just breathe” that I’ve been saying for many years now. I’ve recommended to all my friends and family that if they’ve thought about doing yoga but haven’t started I tell them to start and to start with “Yoga With Adriene”. Very beautifully summarized Wendy! I share the same sentiments. 28 already !! Two more days to come but definately going to keep that time you created in my mornings ! I’m also going to a yoga class, that I deeply love, but stretching every single day made me go a step further very fast, I really want to thank you for that ! I only did the 30 days challenge but I’m happy that I still have tons of your videos to discover ! Can’t wait for all the days to come. Awesome practice on day 28! Love it, even though the poses were tough, namely reverse cow and crossing legs to bend over. I have done each day of 30 days of yoga regularly. I skipped on 3 to 4 days (not consecutively) due to various reasons like an ache on lower left back, sneezing fit (oh how annoying that is, kept interrupting my moves and poses), deadline at work or just not up to it. But I got back on the mat very next day because I want to get flexible and energetic. In the last days, this is getting better. Better flexibility, better breathing in tune with the moves, better grounding. On to an encore of 30 days of yoga with Adriene in April. I look forward to that. Dear Adrienne, what a ride this has been. I will miss it for sure when it’s finished. Today I did not feel like doing yoga at all, but after I got myself on the mat I realized that those days when I feel like this are days that I need toga the most. I was surprised at how easily I flipped my dog. Thank you for what has been an incredible journey thus far. Namaste. Thank you so much for this series Adriene. I have loved them and wake up each morning with a smile knowing I am hitting the mat with you and this community of souls who are taking care of themselves. I am very sad that I only have two days left, will definitely be watching your other videos. Thank you for the smiles. Loving this so much! I’m brand new to yoga, have tried it 2 or 3 times in the past 20 years and not liked it. Tried this on a whim, and haven’t looked back. After some injury and being sedentary for several years, I am moving my body and appreciating it! No small feat. Feeling stronger and calmer. Thank you, thank you, thank you! If you don’t see the point in doing a halfway lift, then don’t. Stay folded and stretch out your arms or do neck rolls. Do your thing! Day 28 what glorious fun. Flipped my dauwg that flipped my yoga brain. I have enjoyed comming to the mat every day. I have become stronger and my muscles are starting to pop on my upper arms. (Still not strong enough for crow but I know it will come in time). You inspire me and in turn I have inspired others there sre now three of us in the office doing your yoga and others are asking questions too. soon there will be an army of yogis doing your pensions in peace harmony and downward facing dog. Thank you for such a great journey. Thank you for helping with sciatica. For the first two weeks I opted out of forward fold as it was just to painful. No more though…it’s gone!! I have two days left and I’m saving them – sad about the ‘what now’? Hi Adriene Im at Day 3 of the 30 day challenge and really enjoying your classes. I took up yoga while on holiday this year and have practising in hotel rooms and small spaces 🙂 so there are no excuses. I really love your style and the way you break the movements down. Really looking forward to the next 27 days. Hi Adriene Maureen from Brisbane Australia. Day 8 absolutely awesome class! Thanks for the variations, I’m going at my own pace. Definitely excited about completing the 30 Days! Ha! Today I hopped and flipped – wasn’t expecting that! So much fun today! Like everyday. Had to do it while kids were eating. One kid tells me ‘Dance mommy dance’. While the other says ‘no mommy, you do it like this’. On the day before Thanksgiving, I give thanks for Adriene, and the wonderful gift of her teaching.